Materials: oil on canvas. Dimensions: 65 x 92 cm. Inscriptions: GCaillebotte 1875. Source: www.the-athenaeum.org/art/display_image.php?id=830. Materials: oil on canvas. Dimensions: 61 x 93 cm. Nr.:? Source: http://www.flickr.com/photos/theubersteve/7320707886. P.S. I was not able to find this painting on the site of the museum. Materials: oil on canvas. Dimensions: 102.8 x 147.7. Acquisition date: 1852 (bought by king Ludwig I from the artist). Nr. : Inv. 9643. 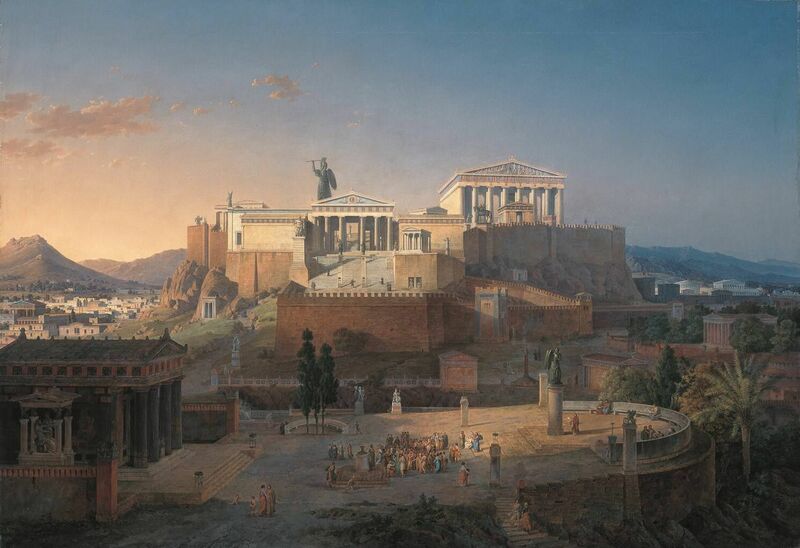 Source: upload.wikimedia.org/wikipedia/commons/c/c4/Akropolis_by_…. P.S. I have changed the light, contrast and colors of the original photo. Materials: oil on canvas. Dimensions: 65.5 x 101 cm. Inscriptions: signed ‘RICO’ (lower left). Sold by Christie’s (London) on November 21, 2011 (Sale 8039). Source: www.paintingsalley.com/data/media/965/Ortega_Martin_Rico_…. P.S. I have changed the light, contrast and colors of the original photo. Materials: oil on canvas. Dimensions: 97.6 x 135.8 cm. Nr. : 1963.91. Source: pds10.egloos.com/pds/200901/10/12/a0100212_49684a358575b.jpg. Corot recorded form and tonal qualities in outdoor drawings and oil sketches, then executed his paintings in the studio. 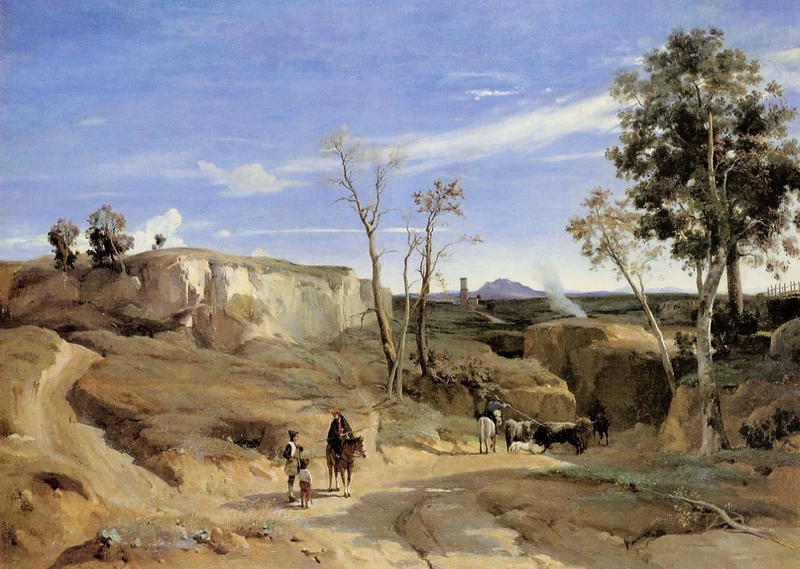 Attracted to the beauty of the Italian countryside, he often sketched around Rome, where he lived from 1825 to 1828. This painting’s highly structured composition, based on forms moving into the distance along a series of diagonals, is characteristic of Corot’s early style and recalls the classical landscapes of 17th-century painter Nicholas Poussin (http://www.clevelandart.org/collections/collection%20online.aspx?type=refresh&sliderpos=2&searchoption=1). Materials: oil on wood. Dimensions: 20.3 x 27.9 cm. Nr. : 1951.40. Source: 3.bp.blogspot.com/_ShSCuaESlVk/TVIs4d_d88I/AAAAAAAAAkY/gG…. P.S. I have changed the contrast of the original photo. By 1886, Childe Hassam was enjoying artistic success with his atmospheric paintings of Boston street scenes. That same year he left the United States for three years of study in Paris, where he received a disciplined training at the Academie Julian, and at the same time came under the influence of the Impressionists. “Along the Seine, Winter” shares its subject matter with Hassam’s earlier works, but shows very clearly the first changes in his style toward the mature Impressionism of his works of the 1880s and early 1900s. The dark clear colors of the Boston paintings are tempered by the pearlescent light of Paris, which Hassam conveys with a much looser, more fluid brush. The softness of color and touch echoes the mellow winter ambience of the City of Lights (http://dallasmuseumofart.org:9090/emuseum/view/objects/asitem/search$0040/6/title-desc?t:state:flow=3eda45ec-ffa5-40c1-a628-554dfdc828bb). Materials: oil on canvas. Dimensions: 77.7 x 92.2 cm. Inscriptions: VRuisdael (bottom right hand side, with the initials intertwined). Nr. : 92/118. Source: img709.imageshack.us/img709/2685/pantanoenunbosquealanoc.jpg. P.S. I have changed the contrast of the original photo. Materials: oil on canvas. Dimensions: 53.3 x 85.7 cm. Nr. : 71.119 (accession number). Inscriptions: Signed (lower left): Franco / De’ Guardi; inscribed (reverse, upper left, in a later hand): Vuduta del Sante di Rialto / in Venezia / del Guardi (view of the Rialto [Bridge] in Venice by Guardi). Acquisition date: 1871. Source: images.metmuseum.org/CRDImages/ep/original/DP124053.jpg. P.S. I have changed the contrast of the original photo. 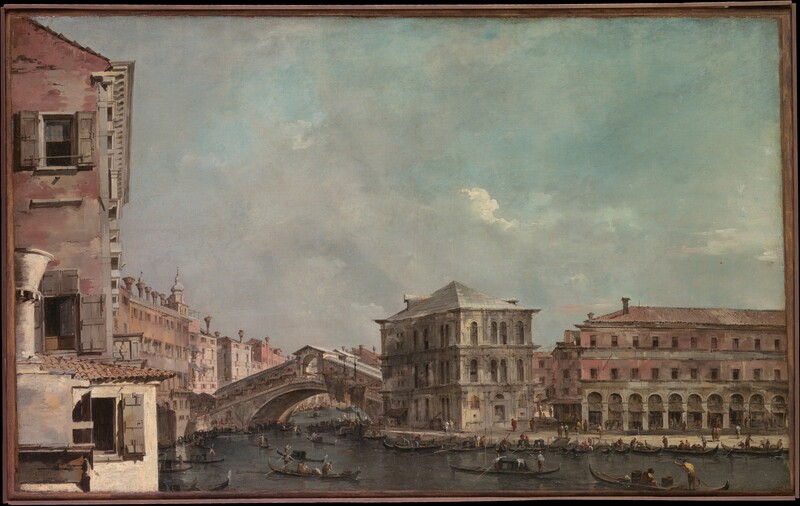 Here Guardi shows the bridge of the Rialto with the Palazzo dei Camerlenghi and the vegetable market on the right. He has created an effect of snapshot-like immediacy by arbitrarily cropping the buildings at the left. The canvas dates to the 1760s and is a pendant of the view of “Santa Maria della Salute” (71.120) (http://www.metmuseum.org/collections/search-the-collections/110001042#fullscreen).